PoPville » Mark It! 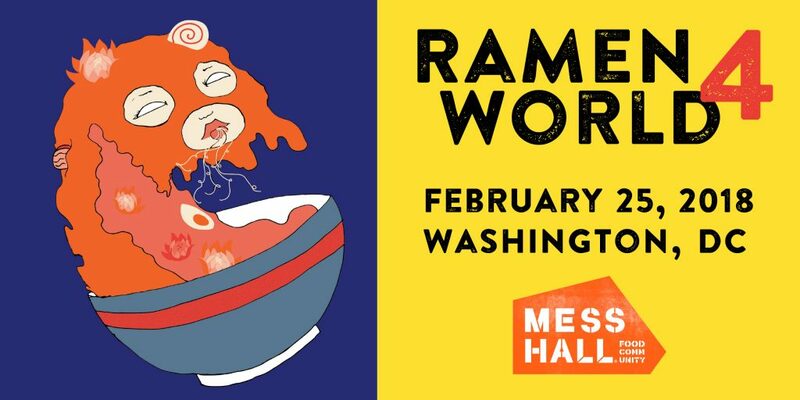 Ramen World 4 Returns to Mess Hall February 25th!! Once a year, Mess Hall opens its event space AND its private kitchens to host DC’s favorite Asian food concepts. The uniquely designed space enables attendees to go behind the scenes and enjoy dishes that are prepared hot and fresh in front of them, as ramen should be served. · Himitsu – DC’s hard-to-get table (and one of Bon Appetit‘s Top 50 Best New Restaurants) comes to Ramen World! Chef Kevin Tien and Carlie Steiner‘s ultra-popular concept will make its best ramen bowl this one day only. · Katsuya Fukushima – brings together his teams from Daikaya, Bantam King , and Haikan to demonstrate their ultra-inventive uses of Ramen. This year, chef Katsuya will feature Impossible Burger – a meatless burger that he helped develop. Katsuya will create the world’s first Impossible Ramen Burger and other surprises. · Wolfgang Puck’s The Source – Chef Russell Smith, known for everything from dumplings to Peking Duck to buns, demonstrates his ideal bowl of ramen. · Chaplin’s Ramen House & Cocktail Bar – This Shaw institution shows off its authentic ramen. · Paper Horse – Ramen powerhouse Erik Bruner Yang‘s newest Ramen Concept, found in the new H Street Whole Foods Market, starring chef Mike Galyen. · Abunai – Beloved Mess Hall’s Member – The iconic red truck will be parked outside, serving up a modern Hawaiian ramen dish. · Nomad Dumplings – Mess Hall Member Karen Hoefener serves up our absolute favorite dumplings in DC! · Momo Yakitori – BE THE FIRST TO TRY these traditional Japanese skewers COMING SOON to 2214 Rhode Island Ave, NE. The highly-anticipated event will take place on Sunday, February 25th, 2018. Two timeslots will be offered for the event, with the first round beginning at Noon and ending at 2:00PM. There will be a break for chefs to reset and restock, before resuming Round 2 which will begin promptly at 3:00PM and will end at 5:00PM. Tickets ($70-$110) go on sale February 2 at 6 am via Eventbrite and include unlimited food, Kirin Ichiban, and craft cocktails prepared by popular DC bartenders. Eventgoers will also bring home bottles of Tamari Soy Sauce.